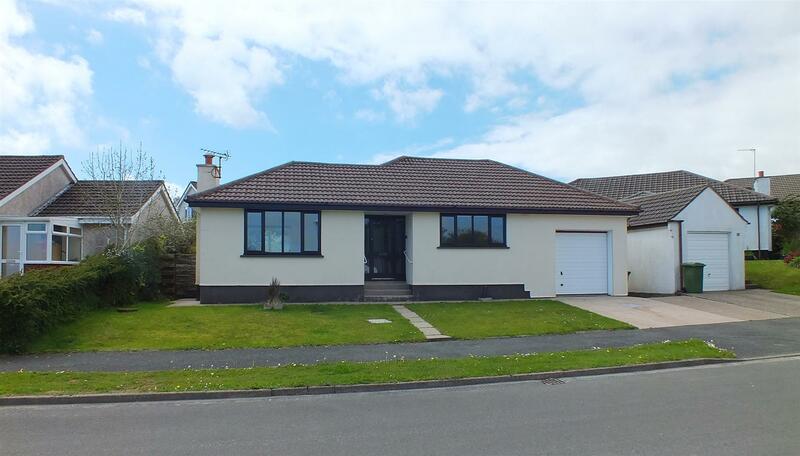 Modern Detached True Bungalow in a Popular Residential Area. Enjoying a Distant Sea View Through the Neighbouring Properties. Close to Local Shop, Primary School, Play Park & Main Bus Route. Bright & Spacious Accommodation with Potential for 1st Floor STPP. Comprising Large Dining Hall, Spacious Lounge & Dining Kitchen. 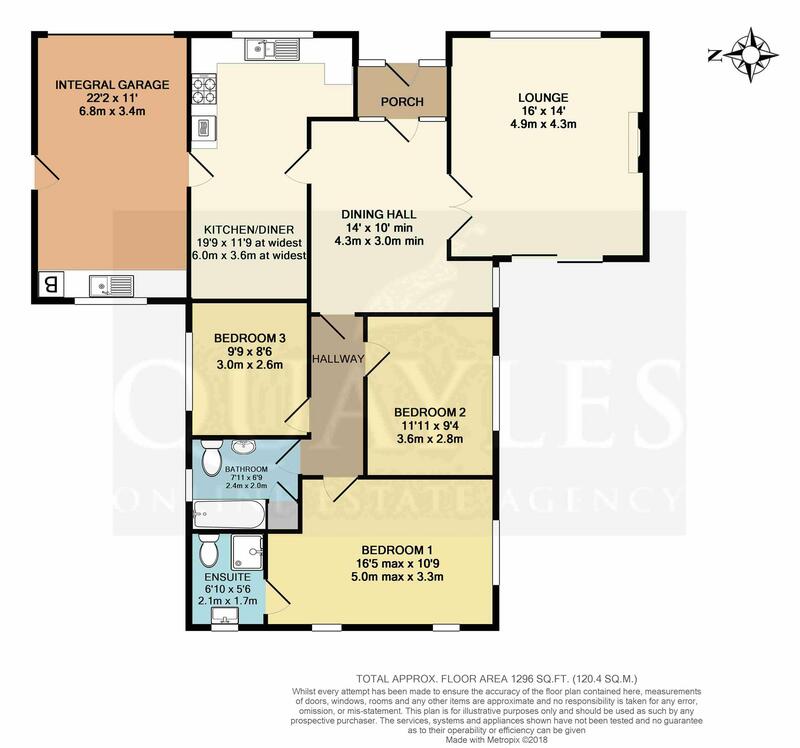 3 Bedrooms (2 Doubles), Family Bathroom & En Suite Shower Room. Gas Fired Central Heating & Timber Framed Double Glazing. Large Integral Garage with Utility Area & Off Road Parking for 1 Car. Open Plan Frontage & Enclosed Terraced Garden with Lawn & Patio. Travel into Onchan along Governors Road, across the mini roundabout and onto Main Road. Turn Left at the first set of traffic lights, by the Manx Arms public house, into Avondale Road. Follow the road up past the 'Archibold Knox' public house along Hillberry Road and turning right into Birch Hill Crescent. Continue straight ahead taking the fourth right hand turn just before Birch Hill Stores. Continue on down the hill, bearing left where the property will be found on the left hand side, being clearly identified by our For Sale board. Canopied porch with night light. Glazed timber framed entrance door and side lights. Coved ceiling. Obscure glazed timber framed inner door and side lights lead into the expansive dining hall. A spacious area with a recessed, double glazed, timber framed window. A multi functional space which could also incorporate a study area. Coved ceiling. Smoke detector. Doors to the inner hall and kitchen. A pair of glazed multi pane doors lead into the lounge. A superb room enjoying distant sea views via a large timber framed, double glazed window. 'Adam' style open grate fireplace (currently unused) with a marble hearth. Double glazed aluminium doors over look and lead out to the rear patio and garden. Coved ceiling. Wall lights. Dado rail. TV, internet and telephone points. Naturally separated into two areas - the dining area being located to the rear and having a door off, leading to the integral garage. Coved ceiling. Two telephone points and a clear opening to the kitchen which has been fitted with a range of medium oak fronted wall and drawer line base units together with additional niche shelving and laminated work surfaces incorporating a 1 1/4 bowl stainless steel sink with a lever mixer tap. Inset 4 burner gas hob with a filter hood over. Built-in 'Tricity Bendix' double electric ovens with eye level grill. Space for a fridge freezer and dishwasher. Background tiling and counter lighting. Distant sea view via a timber framed, double glazed window. A generous single with a utility area to the rear along with a double glazed timber framed window and half glazed door to the side of the property. Electrically operated up and over door. Stainless steel sink and base unit. Work surfaces. Plumbed for a washing machine, space for a tumble dryer. Fitted shelving. 'Ideal' gas fired combi boiler. Light and power. Consumer unit. Access to the part boarded attic. Smoke detector. A double room with a double glazed, timber framed window to the side. A large single/small double room with a timber framed, double glazed window to the side. Fully tiled and fitted with an ivory coloured suite of panelled bath with a 'Mira' fully plumbed shower over, WC and pedestal basin with a mirror fronted vanity unit over. Obscured, double glazed window. Ceiling spotlight fitting. Vinyl floor covering. Shelved linen cupboard. An excellent, dual aspect double room with three timber framed, double glazed windows. Bedside wall lights. Ample space for freestanding furniture. Door to the en suite shower room. Fully tiled to complement the contemporary white suite of push button flush WC, vanity unit with a top mounted basin and corner enclosure housing a fully plumbed shower. Mirror fronted vanity unit. Ladder style towel warmer. 'Silavent' extractor. Timber framed, obscured, double glazed window. Vinyl floor covering. To the front of the property is an open plan lawn with a pathway leading up to and around the property with gated access to the rear garden. A west facing private patio enjoys plenty of sunshine hours, ideally located outside the lounge with steps up to the higher level lawn which runs across the top of the plot. A further low maintenance gravelled area provides a discreet location for line drying laundry. Fenced boundaries and planted borders. Cold water point. All mains services are installed. Gas fired central heating and timber framed double glazing.